2066 N Canelo Hills, Mesa, AZ.| MLS# 5904900 | Charlene Malaska, (602) 790-5464, Malaska Real Estate - Your Premier Real Estate Agent for Handling Las Sendas, Mountain Bridge, The Groves and Red Mountain Ranch. I also can help with your Real Estate needs in Mesa, Gilbert and Scottsdale! Your opportunity to enjoy the lifestyle community of Mountain Bridge has arrived! Completed in December 2018 and located on a premium lot, this home has been extensively upgraded. 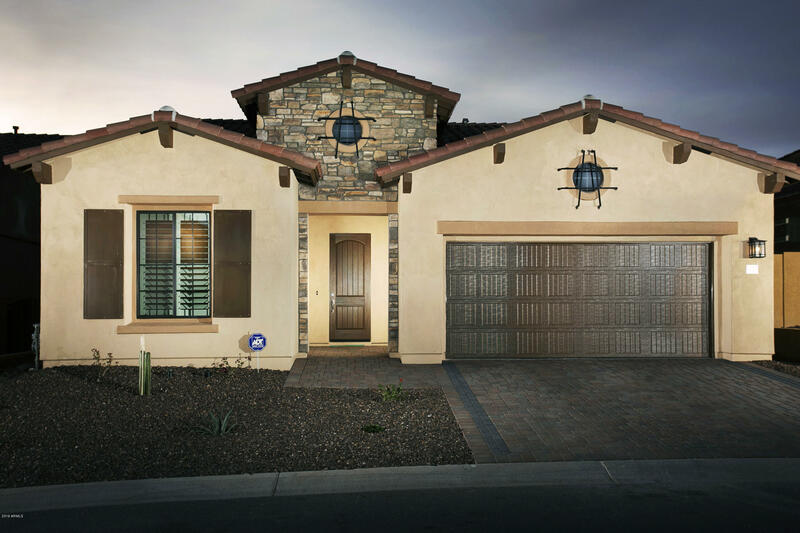 Welcomed by a stunning stone facade, you'll be greeted by soaring ceilings, wood-tile flooring, plantation shutters, 2-tone paint, brushed nickel hardware and fixtures, and upgraded baseboards. The kitchen boasts Frigidaire Professional appliances, pendant lighting, staggered cabinets, and butler's pantry. If you prefer gas cooking, it's been plumbed for an easy swap. The highly desired window wall features remote Hunter Douglas blinds. Additional interior features include French doors on the den, R/O, water softener, 2' garage extension, and laundry cabinets. The low maintenance backyard is (Click ''MORE'') enhanced by a heated pool, artificial grass, extended patio, and view of a beloved saguaro. The Mountain Bridge lifestyle includes fitness center, tennis/basketball/pickle-ball courts, heated pool, spa, parks, hiking trails, putting green, event lawns, and a Full-time Lifestyle Coordinator. New furnishings are available on a separate Bill of Sale, so no reason to delay soaking up the sun!